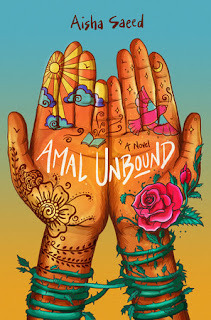 My newest pre-release purchase to arrive is the fabulous middle grade novel Amal Unbound by Aisha Saeed (chosen as one of the texts for this fall's Global Read Aloud). This is a powerful story about economic exploitation and indentured servitude, as well as about the power of standing up for yourself and for what's right, despite the risks. The book reminded me in some ways of Francis Hodgson Burnett's A Little Princess, which was a favorite of mine as a child. This is definitely one that will grab readers' attention and lead to important discussions and questions!